“The film which you are about to see is an account of the tragedy that befell a group of five youths, in particular Sally Hardesty and her invalid brother, Franklin. It is all the more tragic in that they were young. But, had they lived very, very long lives, they could not have expected nor would they have wished to see as much of the mad and macabre as they were to see that day. For them an idyllic summer afternoon drive became a nightmare. This film is based on the life of American serial killer, Ed Gein of Wisconsin. WhileGein has been the subject of many horror movies over the years including Norman Bates of Psycho (1960) and Buffalo Bill the demented killer in The Silence of the Lambs (1991). In fact, Ed Gein did wear a human’s scalp and face. Gein did this however, to help quell his desire to be a woman, not because of a skin disease as with Leatherface in the film. Also included in his uniform, Ed Gein wore a vest of skin complete with breasts and female genitalia strapped above his own. 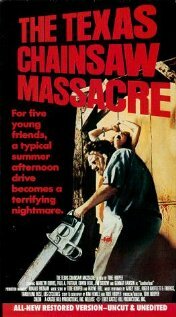 Despite the obvious implications of the film’s title, only one victim is killed by a chainsaw. Two more are bludgeoned, one is impaled on a meat hook, and one is run over by a semi truck. This film is an example of a money maker! It was made on a budget of just sixty grand, later costing 83,000 but has grossed over 30 million to date. Director Tobe Hooper claims to have got the idea for the film while standing in the hardware section of a crowded store. While thinking of a way to get out through the crowd, he spotted the chainsaws. The human skeleton in the house at the end of the movie was a real human skeleton. They used a real one because a human skeleton from India is far cheaper then a fake plastic skeleton. Alternate titles for the film included “Headcheese”, “Leatherface” and “Stalking Leatherface”. Due to the low budget, Gunnar Hansen (Leatherface) had only one shirt to wear as Leatherface. The shirt had been dyed, so it could not be washed; Hansen had to wear it for four straight weeks of filming in the Texas summer. By the end of the shoot no one wanted to eat lunch with Hansen because his clothing smelled so bad. According to John Larroquette (of Night Court fame) his payment for doing the opening narration was a marijuana joint.